There have indeed been some rather memorable individual performances down through the years to spice Cuban National Series post-season play. Outfielder Alexei Bell (2007) once smacked two homers in a single inning for Santiago during one playoff session and the same Bell also registered the oddity of three base knocks in the same frame during another post-season fray. Ernesto Molinet repeated the single-inning pair of homers for Habana Province only two seasons later. Omar Linares once homered in six straight playoff games (during the 1997 Revolutionary Cup post-season). But so far there has never been anything to quite match the rare performance authored over the past two weeks by veteran (but still young at 24) right-hander Freddy Asiel Alvarez of the Villa Clara Naranjas. 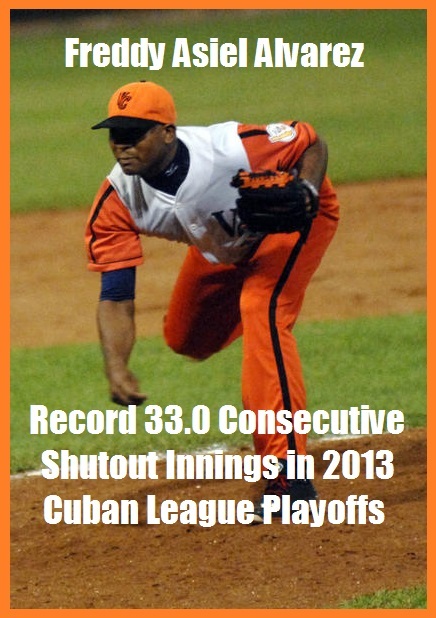 Alvarez has now tossed four consecutive near-complete-game playoff shutouts (8 or more innings during each start) and has already written a new chapter in the Cuban League record book with his 33.0 consecutive scoreless innings. In the process he has also single-handedly launched his surprising underdog Villa Clara team (fourth-place regular season finishers) straight into the driver’s seat in the chase after this year’s Cuban League championship title. The fourth straight brilliant outing for the Naranjas ace came last night in Victoria de Girón Stadium (Matanzas) during the lid-lifter of the league finals, a 4-0 victory for Ramón Moré’s overachieving ball club which is shooting for its first Cuban title in eighteen years (the last coming back in 1995 under manager Pedro Jova). Alvarez breezed through eight innings allowing a mere four safeties (all tame singles) and benefiting from a game-clinching fifth-inning uprising sparked by a pair of RBIs from former Holguín shortstop Yordan Manduley, plus an insurance-proving solo homer in the sixth off the bat of Ariel Borrero. For the fourth straight time Freddy Asiel was assisted by the stellar closing ninth-inning relief of Jonder Martínez, currently on loan from Artemisa courtesy of this winter’s mid-season reinforcement draft. As impressive as the Alvarez outings have been, it his perhaps more remarkable still that three of the four have come on the road – a vital factor given that Villa Clara has suffered from a home field disadvantage in both playoff rounds. A review of the historical record confirms the rather unmistakable conclusion that Freddy Asiel has proven over his short career to be a far different (and better) hurler under the pressures of international tournament outings or post-season league games – games when there is little margin for error and when championship banners are the ultimate prize. His playoff winning percentage is considerably higher than his won-loss standard for regular-season action; over the course of the past couple of campaigns Alvarez has been little better than a .500-level pitcher and he has rarely dominated league hitters in domestic play the way he often has in a number of brilliant international outings. Most memorable are his brilliant starting labor versus a big league-laced Dominican lineup at the 2011 Panama IBAF World Cup and also his stellar losing effort in late relief against the Americans during the 2009 World Cup finals in Nettuno, Italy. Why a different Freddy Asiel seems always to show up for the most tension-packed games is now a conundrum to be deeply pondered. Somewhat overlooked in the brilliant glare of recent Alvarez starts has been the mostly spotless relief effort (he did lose once) turned in by Martínez, who had largely faded from the scene in recent years. Jonder earlier enjoyed a number of top seasons as a starter with the recently disbanded Habana Province club where he won a league ERA title (1.55) in 2008 and a league championship under manager Esteban Lombillo a year later. Jonder was once a mainstay of a Habana Cowboys team that for a few short years boasted the island’s best mound staff and also the main corps of Cuban national team aces; but along with Martínez the remainder of that contingent (including Yulieski González, Yadier Pedroso, Miguel Lahera, Miguel Alfredo González, José Angel García) all fell on hard times when they were shifted en masse to a punch-less expansion Artemisa ball club, a team suddenly stripped of almost all its heftiest hitting offensive support. With saves in four of Villa Clara’s five post-season victories Jonder Martínez (who was the successful closer in Cuba’s 2011 Intercontinental Cup gold medal victory over the Dutch) has now apparently found a new life in the bullpen with Ramón Moré’s revamped and currently high-flying Naranjas outfit. To place Freddy Asiel’s ongoing spotless streak in proper perspective a few comparisons and parallels are useful. On the big league front, New York Yankees Panamanian closer Mariano Rivera currently holds the all-time post-season record of 33.1 consecutive scoreless frames (only one out better than Alvarez) but this mark was established over several different seasons. The major league World Series mark is also 33.0 innings and once again it is a multi-year record. Hall-of-Famer Christy Mathewson of the erstwhile New York Giants still holds the single-season World Series record of 27 frames with his three consecutive 1905 whitewashes of the Philadelphia Athletics – a record so ancient that neither of those teams have existed for more than half a century. While Freddy Asiel now owns the Cuban league post-season mark by himself, he still stands some distance short of the all-time Cuban League standard of 46.1 frames set by Maximiliano Guitierrez (Vegueros) during National Series #17 (1978). Three other Cuban Leaguers have also topped the 40-inning scoreless-string plateau and they are: Eliecer Velazquez (Mineros, 44.0 innings in NS#11, 1972), Manuel Hurtado (Industriales, 41.1 innings in NS#10, 1971), and Maximiliano Reyes (Occidentales/Industriales, 40.2 innings over two separate seasons in NS#3 and NS#4, 1964-1965). Peter Bjarkman is author of A History of Cuban Baseball, 1864-2006 (McFarland, 2007) and is widely recognized as a leading authority on Cuban baseball, past and present. He has reported on Cuban League action and the Cuban national team as senior writer for http://www.BaseballdeCuba.com during the past six-plus years and is currently writing a book on the history of Cuba’s post-revolution national team.